This entry was posted in Farts on September 17, 2006 by Cote. Winamp released a beta version of Winamp 5.25 that supports full and seamless integration with Play for Sure devices and some older Creative MP3 players. The general support for Plays for Sure has been integrated into Winamp since late February of this year, but is has been SEVERELY lacking. Now you can copy music from your MP3 player and play music right off it through Winamp. Playlist manipulation is seamless from both your local playlist to and from your MP3 player. Feel free to edit your tags and meta data on any of your music files too. It’s such a huge welcome considering how unstable Red Chair Software’s Deubox is for my Dell DJ 30G. It breathes new life into Dell’s prematurely discontinued Dell DJ product line. It’s nice to see non-ipod users getting some love also. This entry was posted in Reference on September 10, 2006 by Cote. 1. Get the latest firmware from dlink. As of this writing, it’s 3.52 for my rev E router. 3. Enable “Allow the computer to turn off this device to save power”, “Allow this device to bring the computer out of standby”, and “Only allow managment stations to bring the computer out of standby” under the “Power Managment” tab under the device manager for your LAN adapter. In my setup I have a Intel PRO/100 VE LAN adapter and I also have to enable “Enable PME”, “Wake On Link Settings” and set “Wake On Settings” to “Wake on Magic Packet” all under the “Advanced” tab. Make certain you have the latest LAN adapter drivers too. These direction assume you know how to access your router locally and you know it’s username and password. I’m also assuming you know the router’s IP assignment. 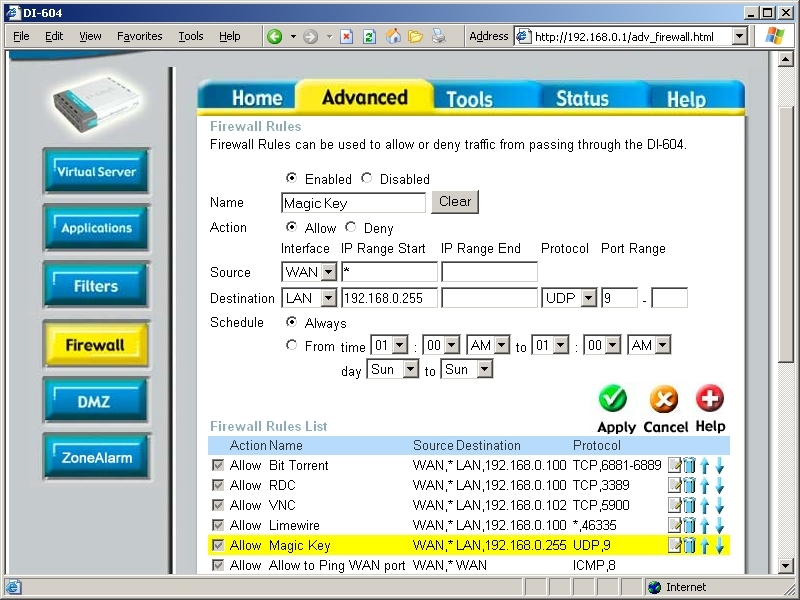 It’s also good to have DDNS (Dynamic DNS) working on your D-link DI-604 if you really intend to use WOL effectively. If your computer is off/hibernating/suspended, then it can’t keep the DNS updated. The utility is free as of this writing. It offers a bunch of options. The rundll32.exe command can be used without quotes from the run dialog from your start button, command line, or a shortcut. The command will only hibernate OR go into standby depending on if hibernation is enabled in your power settings. 2. I can’t wake my machine on an S5 State (total shutdown). I think this is because I have limited options in my BIOS. 3. If I pull/lose power on an S4 state (hibernate). My machine will NOT wake. The bottom line is I can save some money on my electric bill by turning my computer on and off remotely. This entry was posted in Reference on September 2, 2006 by Cote. * Updated DDNS screen and request. * Updated PPPoE WAN settings. * Improved DDNS Update Agent. * Added countdown to firmware upgrade process. * Same firmware as 3.20. Use only if you are having connectivity issues with your modem. VDI-604 firmware for Verizon Fios can be found here. The files above were hosted from the old Canadian site. I have removed those broken links and created local links. I recommend going to support.dlink.com for the latest drivers. I accidentally installed the VDI-604 firmware on my DI-604. When I tried to installed the latest and greatest firmware, 3.52, I kept getting an error message that the file was not compatible. The solution is to crash your router. When you crash your router it boots into a firmware upgrade mode. This allowed me to install 3.52. Hold down the rest button for 10-20 seconds until the router lights go out. Quickly pull out and put back in the power cord. When you login the router will display a small dialog box to browse for your firmware. It may take a few tries and I have not tested this on any other routers other than a few Dlink 604s. Let me know if it works on other models. *Update: Directions to crash the router can be found here. *Update: I removed the dead links and added the newest firmware, 3.53. Dlink support in the US and Canada no longer host the older versions of the firmwares. They also do not host ANY rev A, B, or C firmwares. Thanks to FastEddie and ErikaD from DSLReports for snagging the files before they went extinct.